Modern Minimalist Silver Dangle Earrings with Amethyst, "Minimalist Raindrop"
Minimalist in style, these beautiful earrings come to life in sleek sterling silver. 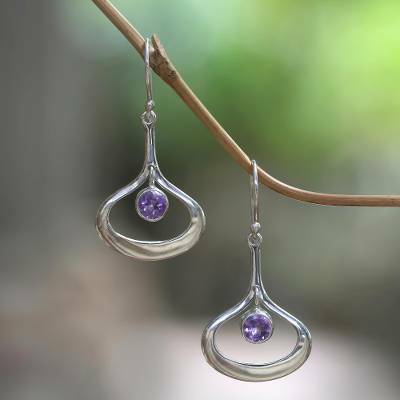 Bali's Wirabhuwana crafts the pair by hand, suspending a single faceted amethyst inside each polished raindrop. I bought 3 pairs of these earrings for girlfriends and my daughter. They are all Feb. birthdays...wanted something unique and Novica doesn't disappoint!!! THE EARRINGS ARE BEAUTIFULLY CRAFTED AND THE STONE IS EQUALLY AS PRETTY. CAN'T WAIT TO GIVE THEM TO MY DAUGHTER. The beautiful amethyst gemstones perfectly highlight the sleek and modern design. Really well made. Love them! These earrings go with everything I have! Beautifully made and proportioned. I love Novica! These earrings are my newest purchase. The silver is a little lightweight, but this makes them perfect for earrings, no heavy weight to deal with. The design is simple, but gorgeous. I love these earrings. They are substantial but not heavy. I just love them. I am looking for more in the minimalist line. Thank you so much!!!! They are even more stunning in person. Nice work. Thank you. The delicate gemstone is so attractively on display within the horizontal oval. Not the usual. These earrings are beautifully crafted in a truly unique design. Very pleased with my purchase. They are the perfect length, and are both modern and elegant.